If you want something very badly, you don't mind waiting for it - no matter how long. Witness the wannabe iPhone owners. Recently, my husband came across a list of 'Waiters' for various products - from a copy of Business Week - who were willing to wait longer for what they want. 1. Hermes Birkin Bag in pure leather - Waiting time is six to twelve months. 2. Dinner reservation at French Laundry Restaurant, Yountville, California - Waiting time is 60 days. 3. Season tickets for 'Green Bay Packers' - American football - Waiting time - wait for this - 35 years. 4. Wagner festival in Germany Waiting time is a mere 7 years. 5. The Ferrari sports car, model F43, waiting time is 2 years. But what outshines all this is the waiting list at the Guruvayoor Temple for 'Udayasthamana pooja'. When I checked the Guruvayur Devaswom website in January this year for something else, I found that the waiting list for this pooja - a dawn to dusk pooja with special worship modes - was up to 2045 or so. The booking cost was in the region of Rs. 50,000, more money to be charged if necessary, at the time of the pooja. I wanted to confirm this, what with my faulty memory , and revisited the site. It says the booking for the pooja is closed now!!!! This is one of those things that you don't expect to happen in the USA. Delhi, yes, Bombay, yes, and Chennai - all the time. No water in the taps. But in Hoboken, across the vast river Hudson from New York city? No. Last Sunday morning, waiting to step into the shower, I found that the pressure of water was low. Being a Chennaiite of many waterless days, warning bells began to ring in my head.. I alerted Sriram and Vandana, and they were also surprised. A call to the apartment supervisor confirmed what we suspected - no water, indeed. and it was worse than we thought. It was not a maintenance shutdown that would have affected only our apartment building for a few hours, but a major shutdown in the city. No water anywhere in Hoboken! And no one knew for how long. We learnt that there was a problem in the neighbouring city of Jersey, and the supply to Hoboken had been cut off, to carry out repairs. We Chennaiites are unfazed by waterless taps at home despite full wells and tanks in post monsoon glut, I still have a stand by of drums and buckets of water for two days' needs, not to mention coloured plastic pots in the kitchen filled with water for cooking. And mineral water for drinking - for who knows when the power might get cut or heaven forbid, the motor itself conk out! The Chennaiite in us went to work and Sriram filled up a tub and a bucket for emergencies, by which time the water had stopped. And nowhere else we could turn to for water. In cities in this country , there is no source of water except what the city gives you. Apart from bottled drinking water, of course. The river? In my mind's eye jeans clad men and women carrying pots/buckets of water from the Hudson, and hauling them up several floors passed by. 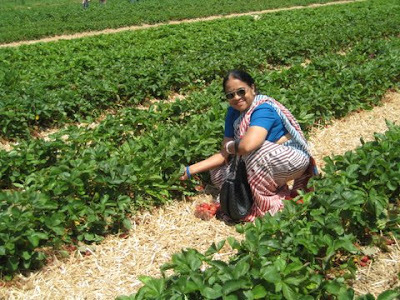 Vandana said that usually when supply was to be shut down for maintenance, there would be sufficient notice, and supply resumed in a few hours. But this was unusual, she agreed. And on a weekend, too. The day passed without water, and we thought of going to dinner in New York, for how could we cook? And local restaurants would have the same problem! However, the need did not arise. For with the usual efficiency and efficacy found here, the workers must have located the problem and sorted it out, and by late evening, the water supply was restored. Even as I am writing this, reports of a steam pipe explosion in midtown Manhattan, New York, are filtering in on TV news channels. 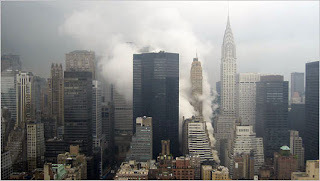 The steam is going right up like a geyser as high as the top of the Chrysler building close by. The TV screen is showing pictures of the steam gushing at great speed up and high. Fire fighters and police personnel are at the spot - fortunately no reports of any fatalities, but some people have been seriously injured, some critically. A city that has not yet fully recovered from the 9/11 trauma, is facing a similar situation - a devastation in that the water, electricity lines which lie underground alongside the steam pipes will also be affected. Not to mention the underground railways, though reports say that the railways have not been affected. Three people from here go to work in the city by train. Shyam, Vandana's cousin is home, Vandana has yet to reach home; and Sriram says that his office being in Downtown, he won't be affected. And they are home, now. 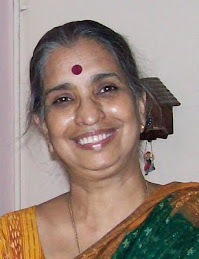 Vandana had organised the outing. 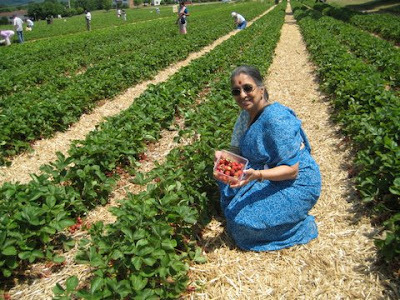 We were to go to a farm in the countryside, about 50 miles away from Hoboken where she and Sriram live, and pick strawberries. I baulked at the very idea. I couldn't see myself involved in any physical activity, least of all climbing trees. I struggled with visions of coconut plucking at home in Madras, where men, with dhotis neatly tucked in, ran up the palms and flung down the cocnuts; and mango plucking, where men below would hold sacking to gently collect the mangoes plucked and thrown down by men in the tree. Vandana smiled mysteriously and promised me I would enjoy it. 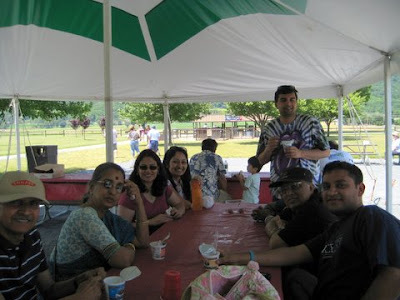 The group included Vandana's parents, who like us, are visiting from India, Sriram-Vandana's friends Jaisri and Apsara, and Shyam, Vandana's cousin who is doing a summer internship at New York. Four seniors and five management types. And so we went, packed in two cars to the farm. It was a dream of a day, with blue skies and cotton wool clouds, and rolling hills in the background. And strawberries growing on low lying plants, barely a foot high! 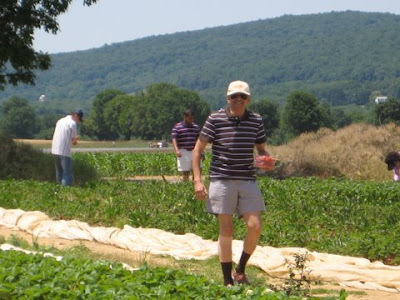 The motley group had a field day, rummaging for hidden strawberries among the low bushes. 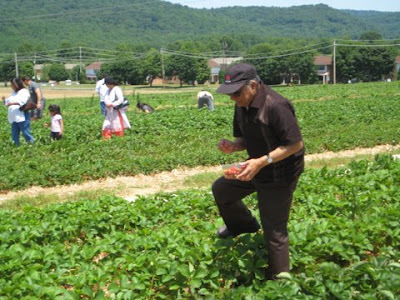 We could pick all we could, get them weighed, pay for them and bring the fruit of our labours home. And so we picked them, and despite creaking joints and recalcitrant limbs, I was able to pick quite a few too. The other seniors in the group were swifter and filled their little boxes soon. But these, fresh from the vine, were rich and juicy. 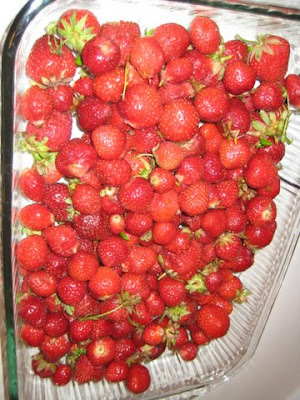 A picnic lunch, with fresh strawberries for dessert, rounded off the day nicely. This is what I saw on one of the streets of New York. 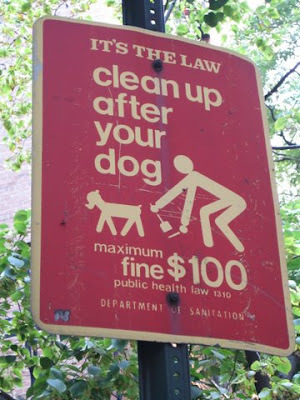 And yes indeed, if you walk your dog on the streets, as in any other place in the country, be prepared to scoop up its poop - or face the consequences. Which explains the plastic bags dog owners carry while walking their pets. In Seattle, one evening a strange woman knocked at our door, and asked for a plastic bag. "I am so sorry," she said , "I forgot to bring a bag with me, and my dog has messed up the pavement." We went to a movie yesterday. In a way it was a first of sorts. 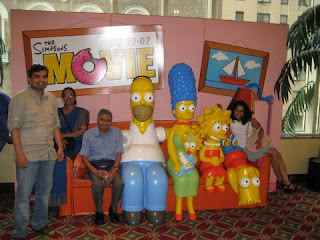 Though we have visited this country before, this was the first time we went to a movie theatre in the USA - unless you count the visit to the Imax theatre in Los Angeles. From the street, there was nothing to indicate what is inside, except the lights on the marquee. Upon going in, I was amazed to learn that the building housed 14 theatres. While I stood with mouth agape, my daughter-in-law Vandana told me that there were complexes on Times Square which housed more than 40 theatres. No crowds, no conversations, no agitated shouts, it was so quiet, it could be called dull. Where was the excitement, the throb of humanity, the vibrant loud thrum that accompanies the screening of movies in India, specially, Madras? Isn't that part of the movie experience? And I was in for a big shock when I entered the theatre - it could house barely 250 people. We were to see 'Knocked Up', one of the latest pictures, and there were no crowds on a Saturday evening - only half the seats were filled. In the foyer of the 4th floor I noticed 4 big posters from the old movies. Adorned in intricately designed frames, the posters were from favourites of the golden oldies - 'Gone With The Wind', 'Casablanca', and 'Godfather'. the other one slips my mind - a reminiscence of the glorious days of cinema. I could imagine Vivien Leigh, dressed in her beautiful robes and flashing jewellery, hanging on the arm of a dashing Clark Gable, entering the theatre for the premiere of Gone with The Wind, amid the clamour of star struck fans. On one of the huge landings was a bench with a larger than life Simpson family seated in full splendour - an indication of present day favourites. The crowds that shun the movies have not disappeared - they have only moved on. 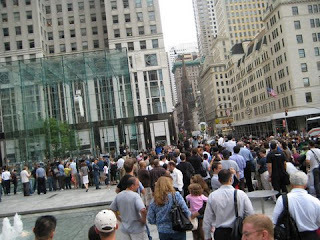 Earlier in the week I had read in the New York Times about people who were waiting in line for the iPhone to be sold. On Thursday we saw pictures of people who had taken up spots in front of Apple Stores to buy the iPhone, from Wednesday evening, to buy the phone on Friday at 6 pm when the sales would begin. 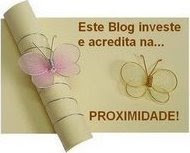 How crazy, I thought - Lord, what fools these mortals be, was what rung in my ears. 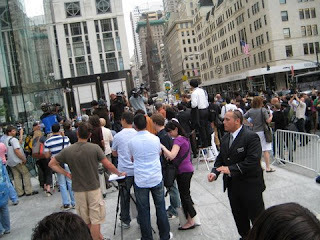 But my husband was not satisfied with the reading - he had to see for himself what he calls the 'Sivaji' of New York and check out the peo ple who would wait for two days for a hand held device costing almost $500. On Friday evening at about 5 he was in the city with Vandana at the flagship Apple Stores on Fifth Avenue. And there he saw the queues of people which went beyond three blocks - people just waiting to buy the phone. And there was the media with cameras and mikes, talking to the people in the line. And Starbucks was giving away free cups of coffee - product placement? - while someone was giving away bottles of water. Some youngsters asked my husband if there was a carnival or celebration going on, and he enlightened them. Another one wondered if the release of the latest Harry Potter had been advanced. What impressed him, said my husband was the kind of people waiting in line - they could be anyone, he said, a doorman or a finance analyst. Some of them were ready to, in fact had been waiting to, sell their spots on the queue before the shop opened at 6 pm. Others said they had planned to sell them on eBay, and even Craig's list - an online shopping place for selling and buying used goods!!! Vandana says that iPhones are going at $ 950 each on eBay, average price. so one can guess what the doorman types were doing there.